The thing that makes the stories of Saul/Paul in the Bible and Alma (both older and younger) in the Book of Mormon so fantastic is seeing who they started out as, and who they transformed to be. The greatness of their stories is not that they were incredibly faithful men, but the journey that took them from vile sinners to the amazing true disciples they became. It’s easy for us to not judge them for their past sins because we get to see it from a distant perspective, it’s harder for us when it’s a little closer to home. Sometimes when we don’t get to see any of the process, when we don’t get to see that person suffer like we think they should suffer for their sins, or when we see lingering visual reminders of past sins, it can be difficult to acknowledge the sincerity of their mighty change of heart. One of the hardest aspects of the atonement of Jesus Christ can be recognizing that it works in other people’s lives too. There are so many ways that we like to mentally place others in certain categories, whether it’s the faithful adult coming back to the ward where they were a stinker as a teenager, the woman who said something mean to you, or the man who cheated on his wife, and it can sometimes be difficult to recognize their changes. So how do we recognize the changes in someone else? That’s a difficult question to answer. Sometimes the sincerity of their repentance has great impact on our own personal lives, we aren’t casual observers judging others around us, but casualties of the effects of their choices. (Click here to read a post that goes more in depth on these situations. )The bottom line is: The best way to give others room to allow the atonement to work in their lives is to not judge others. If we need to know whether they’ve changed or not, the spirit will testify to us. If we don’t, we will just have to have faith. Either way, it is not our job to judge or punish others for their sins. No matter what, bad behavior on the part of another in no way justifies our own bad behavior in retaliation. Ever. Our job is to be righteous and faithful followers of Jesus Christ striving to do the best we can to develop our own mighty change of heart to become continually more like Him. We need to remember that sometimes the people who have a hard time acknowledging change in others are the ones who have yet to understand, whether because of lack of experience or lack of knowledge, what a mighty change of heart entails and how difficult it truly is. Once we understand through personal experience, the temptation to judge others is much easier to resist. All of us are on a different schedule of learning and we need to be patient with their process and timeline as well. None of us are perfect, yet, but unless you’ve murdered someone (which I’d highly recommend not doing) everyone still has the ability to be. As we allow others around us to become more like Christ our ability to grow expands and we all benefit. I know you’re going to be tempted to skip the video, but I hope you choose to watch it! 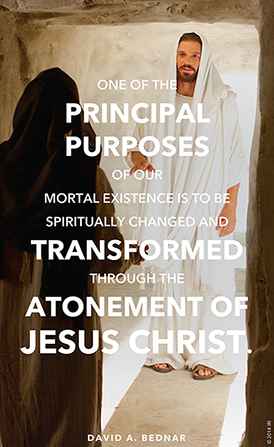 The words of the Savior are always our ultimate example. You hit the nail exactly on the head with this one! I have a half written blog post about this exact topic. It’s half written because I haven’t been able to think it around completely and this post has answered some of my questions. The spirit has testified to me some of the points I couldn’t come around to on my own. Well done, and THANK YOU! Thanks Britta! I’m glad that you were able to hear what you needed to hear!